In June 2017 I submitted my dossier for “rank review” — the non-lethal review for promotion to full professor. Unlike the tenure review, this procedure wasn’t “up or out.” In other words, if I failed, I wouldn’t be fired; I’d simply remain an Associate Professor. Well, folks, I passed. I received the good news late last spring, and I met with the various deans involved in my review last month for a heartening debriefing meeting. 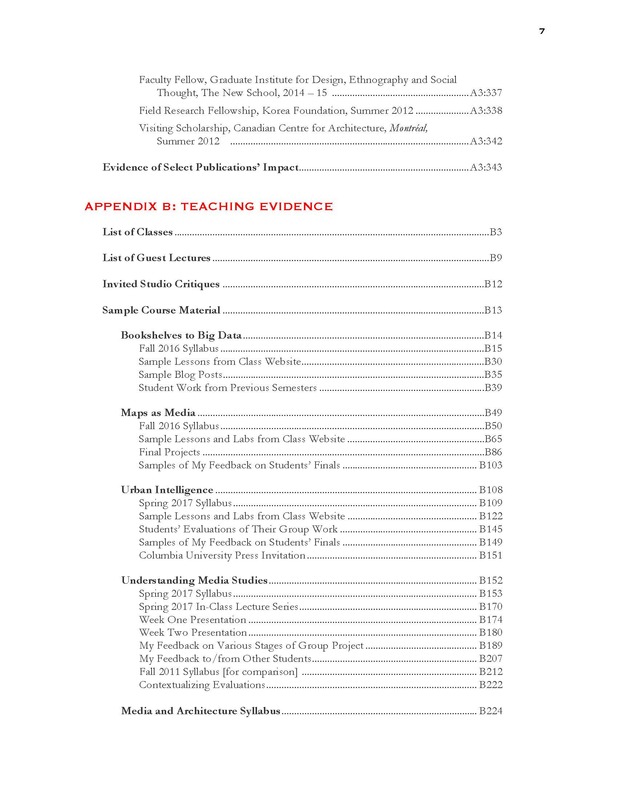 While compiling my tenure dossier six years earlier, I found tons of online guides and helpful tips on the Chronicle of Higher Education and Inside Higher Ed. I wrote a few cathartic blog posts about my dossier-ing process: one about the torture of writing my statement of purpose, one about the dossier’s content, one about the submission process, and one celebrating my relief (at having passed) by offering my personal statement to the Gods. But I found very little public discussion about, and very few tips for, the full-professor dossier. 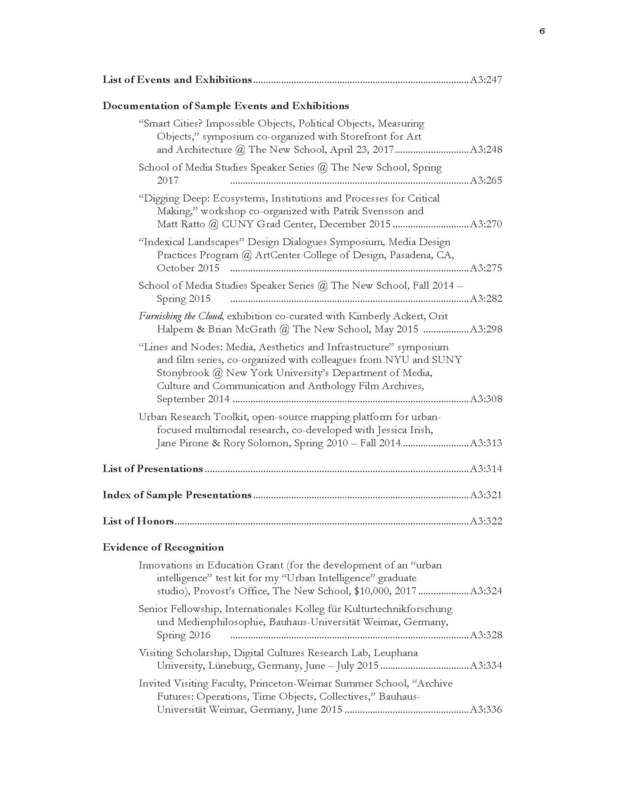 Since I apparently did something right in my own rank review (thanks, in no small part, to an excellent editorial review by a generous senior colleague), I figured I’d share some of my dossier materials — my statement of purpose and table of contents — in the hope that they’ll be useful for others. I aimed to find a cohesive, coherent framework for my eclectic, purposefully undisciplined work. I realized that an external reviewer might see my publications and talks and projects — which are strewn across architecture, urban studies, media studies, art, library science, and geography (and beyond) — and wonder what kind of a weird mongrel I am. I had to show that that medley was methodical (even if it wasn’t). By presenting myself as a “mediator” between disciplines, and between fields of scholarship and practice, I aligned myself with the core intellectual concerns of my home discipline, Media Studies. But then, in order to dispel fears of interdisciplinary dilettantism, I also had to demonstrate that my work has been recognized and validated by folks in the other disciplines with which I’m in dialogue. 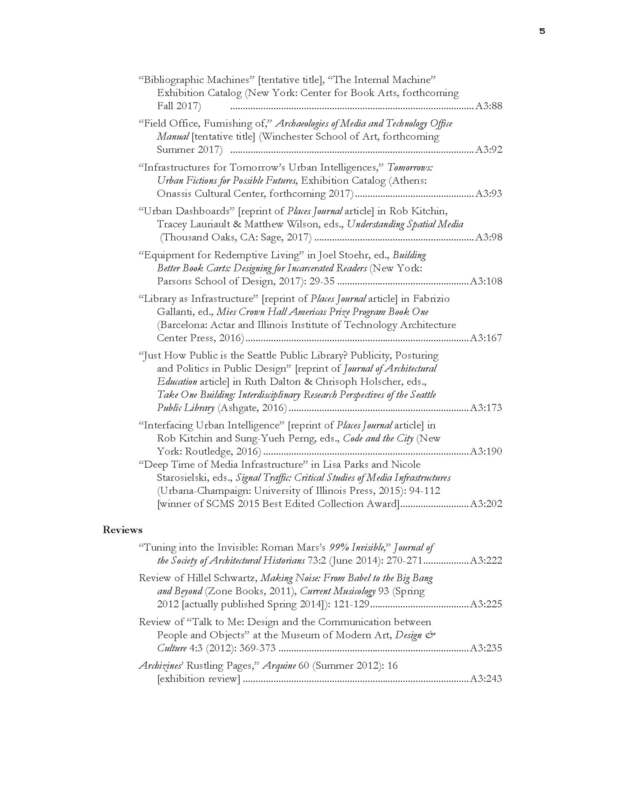 I justified my choice to publish primarily in open-access (and sometimes para-academic) venues by framing these platforms as consistent with the values — and aesthetics — that are central to my work. In the teaching section, I aimed to display the range of courses I’ve taught, identify the principles that unite them, highlight my successes, non-defensively contextualize the struggles — and frame those challenges as opportunities for me to practice resilience and adaptability. In the service section, I aimed to convey both the volume and quality of my service. Having served on close to a hundred internal and external faculty reviews, I’ve seen lots of “service” narratives that are simply a lifeless list of committees. And what’s more, many candidates provide no evidence of their service in the dossier appendices. If we’re to value good university citizenship — and ensure that service is equitably distributed — we need to do a much better job of accounting for our own contributions and asking other to do the same. So, in my dossier, I sought to describe my concrete contributions in each committee or appointment; link those service activities, whenever possible, to the skills and interests that animate my scholarship and teaching; offer some indirect evidence that my colleagues must apparently regard me as a collegial, reliable collaborator; and convey my ongoing commitment to being a good citizen in my department, school, university, and larger community. Below, you’ll find my seven-page table of contents (which includes only my post-tenure work), and below that, my personal statement. Spring 2017 was perhaps the season when “epistemological” became a household word. Or close to it. The term appeared with increasing regularity in major newspapers, and lots of people were questioning the state of “facts,” the party politics of datasets, and the veracity of evidentiary records. It was thrilling to see such heady topics enter public discourse, but the circumstances surrounding their rise were really quite tragic. The White House’s new occupants equated “truth” with the “strong beliefs” of a president who took his briefings from cable news and conspiracy theorists. This was an era of Wikileaks and ransomware, of rogue federal agency Twitter feeds and disappearing climate data. Meanwhile, the climate itself was threatening our scientific repositories: melting Arctic permafrost flooded the Svalbard Global Seed Vault, Norway’s “doomsday” archive of biodiversity. Amidst all this eco-precarity, cyber-insecurity, and epistemological uncertainty bloomed a thousand counter-forces: virtual private networks, encrypted streams, and citizen archivists who sought to preserve security, uphold accountability, and embrace the pursuit of truth. How do these institutions and individuals – executive branches and courts, intelligence agencies and archives, news organizations and informal networks of activists – inform what we know to be true? How, by creating and preserving or redacting and discarding various media, do they cultivate the epistemological ground upon which we tend our cultural narratives and public knowledges? Such questions have animated my work – in publication and creative scholarship, in the classroom, in my service at The New School, and in the local and global communities – for the past eighteen years. I’ve been examining how material infrastructures mediate intellectual infrastructures, and vice versa – how our material world, and the spaces and objects we design within it, both shape and are shaped by our structures of thought. And because different infrastructures are typically entwined, or nested within one another, my exploration has traversed scales: from the scale of the object (the book, the file card, the field guide, the screen, the interface, the desk, the closet), to the architectural scale (the library, the archive, the urban intervention, the control center, the exhibition, the subterranean repository), to the urban scale (ancient urban record-keeping and acoustics, computational urban visions at the World’s Fairs, contemporary smart cities), to the scale of the networks and “clouds” that link together and extend beyond these other sites of mediation (logistical systems, data flows, ubiquitous surveillance, technical standards, cultural conventions). To take a concrete example of this scalar integration: the classification scheme begets the filing system, which begets the filing cabinet, which begets the office, which begets the skyscraper, which begets urban form, and so on. The data model begets the interface design, which cultivates the user experience, which constructs the user as a certain kind of “subject” and embodies a particular epistemology and ideology. These systems of influence (and I do stress influence, rather than determinism) work in both directions: from the macro to the micro scale, from the material to the conceptual, and back again. We can find countless historical and contemporary instantiations – and even speculative future visions – of this chain of infrastructural influence (it’s not hard to imagine a Google-governed global brain!). Such systematic thinking has informed all areas of my professional practice: my scholarship, my teaching, and even my service, as I’ve observed how the various material and ideological and bureaucratic dimensions of an institution are integrated. My work has been grounded in several fields of exploration within media studies. First, ever since my undergraduate days I’ve drawn on theories of media’s materiality, which compel us to examine not only what’s projected on the screen or printed on the page, but to look at the screen and the page themselves, as well as the cultural conventions and technical apparatae informing their production, distribution, and consumption. Marshall McLuhan and Harold Innis provided early material inspiration, and I supplemented this foundation with the work of German culture and media theorists like Walter Benjamin and Cornelia Vismann, anthropologists like Arjun Appadurai and Daniel Miller, feminist scholars like Donna Haraway and N. Katherine Hayles, and media historians and theorists including Lisa Gitelman, Jonathan Sterne, and Matthew Kirschenbaum. Lynn Spigel and Beatriz Colomina, both of whom examine the materiality of media architectures (and the epistemologies they embody), have been guiding forces for my research since graduate school. Second, and related, is the field of media archaeology, particularly the work of Friedrich Kittler, Jussi Parikka, and Markus Krajewski, who shares my nerdy interest in index cards and classification schemes. Media archaeology arrived, via new German-to-English translations, at the perfect time for me (and for other scholars and artists): it provided a corrective to all the breathless new-media scholarship espousing a placeless, disembodied, frictionless digital future. By questioning the newness of “new media” and focusing on alternative material histories of media, media archaeologists drew my attention to deeper histories and to other materially oriented disciplines like archaeology proper. Finally, I’ve found the cross-disciplinary work in information and media infrastructures to provide a capacious framework for my wide-ranging research and teaching interests. Information scientists Geoffrey Bowker and Paul Edwards, sociologist Susan Leigh Star, and media scholars Lisa Parks, Nicole Starosielski, and John Durham Peters have helped to create an infrastructural community for my own infrastructure research. And this work has inspired me to think of my teaching as a means of providing supportive infrastructures for my students’ work. While I am clearly rooted in media studies, the field in which I earned my PhD and in which I’m based at The New School, I draw on those other disciplines I studied in graduate school, and which continue to inform my work: architecture, urban studies, geography, and library and information science. These other-disciplinary lenses have helped me to think through the “nested infrastructures,” both material and intellectual, I mentioned earlier. I’ve been delighted to discover that my work has resonated strongly in these other fields. I’ve been invited to publish and present in geography and architecture venues, to teach in urban programs, to lead design schools, to keynote archivists’ and librarians’ conferences, and to help build disciplinary infrastructures within and between these and other fields. I was even invited to serve as multimedia editor of the Journal of the Society of Architectural Historians and to consider becoming a strategist for one of the U.S.’s top library systems. Yet I’ve remained where I am because this intra-infrastructural space suits me. It’s where I do my best work. I’ve been pleased to hear repeatedly that my respectful and purposeful approach to interdisciplinarity – my willingness to read the literature in other fields, to speak humbly with people in other fields, to acknowledge the specialized labor in those other fields, to see the connections between disparate fields – has allowed me to win the respect, and my work to win the recognition, of scholars and practitioners in diverse areas. My grounding in media studies has enabled me to serve as a mediator between these various spaces of thought and practice. The New School has provided an ideal home for me to do this work with students and colleagues, with local collaborators, and with globally distributed academic and professional communities. The university’s pedagogical, epistemological, and social infrastructures – traversing disciplines and bridging design and social research, theory and practice, university and city, local and global, scholarship and public engagement – have both scaffolded my own development and enabled me to help build frameworks for my students’, my colleagues’, and the institution’s own growth. I have proven myself an active scholar and creative practitioner, engaged at the international scale in my scholarly field and various areas of professional and creative practice. I’ve published and presented widely. I have proven myself a dedicated and talented teacher and advisor, serving Media Studies and a variety of programs throughout the university, as well as a global network of students. And I have proven myself a dedicated and attentive university and community citizen, serving in administrative posts and on boards and many committees, liaising between existing programs and professional fields, mentoring faculty, working collegially with staff, and helping The New School and other institutions to envision their futures. The New School has recognized my work with awards for my teaching and research, and students have acknowledged my dedication and skill through their positive evaluations and continued contact for years after they’ve graduated. My New School colleagues have also acknowledged my collegiality through their continued invitations to join them in the important work of mentoring, advising, and institution-building. I hope to continue cultivating these mutually beneficial relationships by taking on new leadership roles, and for this reason I am seeking promotion to full professor at The New School. In this dossier I will reflect on my scholarship, teaching, and citizenship, in that order. In the process, I will refer to the documents in the appendices, which demonstrate my contributions to my department, to the university, to the academy, and to global communities of practice. The volume of material and the size of my image-intensive files have prevented me from combining all of this material into a single pdf. 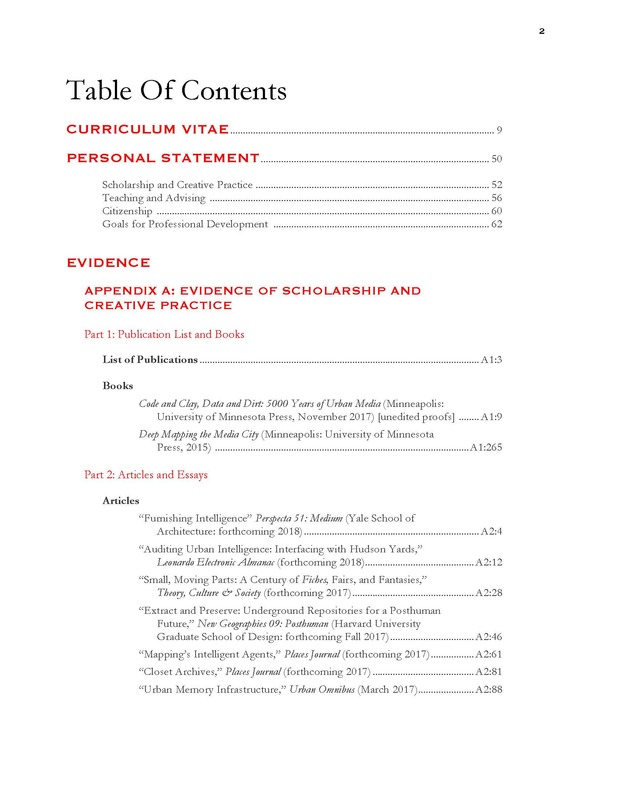 Instead, you’ll find six separate sections: (1) this introductory section, with the table of contents, my c.v., and this personal statement; (2-4) Appendix A, which includes evidence of my scholarship and creative and professional practice, and which, because of its size, is broken into three parts; (5) Appendix B, which includes evidence of my teaching and advising; and (6) Appendix C, which includes evidence of my citizenship. Please see the table of contents, above, as well as the tables of contents at the beginning of each appendix, for more information about what is included in each section. I have not used continuous pagination; each appendix is numbered separately. In what follows, when I refer to material in the appendices, I’ll note the appendix letter and page number(s); thus, a reference to Appendix A, Part 1, pages 3-11 will be formatted as such: (A1:3-11). One final note: Much of my work is born-digital, or has been thoroughly documented on digital platforms. This online documentation does not always readily lend itself to capture in the form of a static pdf. While I have attempted to include pdfs of all critical resources in this dossier, those documents sometimes are infelicitously formatted and, with all their superfluous whitespace and junk code, unnecessarily long. I encourage you to view my born-digital material in its native digital format, and I provide URLs to enable you to do so. INFRASTRUCTURES OF PROFESSIONAL PRACTICE. Since Summer 2011 I have published one short-form book, thirty-two articles (plus five translations and reprints), six book chapters (some of them reprints of journal articles), and four book/exhibition/multimedia reviews. Another full-length monograph is scheduled for publication in November of 2017, and (at least) six more articles and seven more chapters are due to be published by Summer 2018. All books are available in Appendix A.1, articles in Appendix A.2, and chapters and reviews in Appendix A.3. I also have two more books, a monograph and an edited collection, in development. My work has been cited widely, in disparate fields, and has led to many global invitations for me to contribute additional publications and present my research. Over the past six years those presentations have included roughly eighty invited talks (on nearly sixty different topics), including six plenary or keynote addresses, and fourteen academic conferences, including two for which I organized panel discussions. I have many more such presentations, at notable venues, lined up for the coming year and beyond. I’ve also been offered five fellowships – including a Spring 2016 senior fellowship at the Internationales Institut für Kulturtechnologieforschung und Medienphilosophie (IKKM) at the Bauhaus University in Weimar, Germany, which is among the most prestigious fellowships in media studies – as well as one invitational curatorial position and another invitational faculty position, two individual grants, and five collaborative grants (A3:322-42). In addition, I’ve organized or co-organized eight public conferences, symposia, event series, exhibitions, and/or scholarly platforms. I am including this work in the Scholarship section of this dossier (A3:247-313) rather than the Service section because it demonstrates a high degree of disciplinary knowledge, interdisciplinary integration, and professional skill, and it has created infrastructures for the development of further scholarly and creative work by various academic and creative communities – and particularly by my students. Many of these events have, in fact, been integrated into my classes. Such platforms represent another means of “making public” my scholarly and creative work, yet they have the distinction of inviting others to contribute, in real-time, to the creation of new knowledge. This concern with public knowledge infrastructures has also informed my choice of venues for publication. Particularly since receiving tenure I’ve become much more attuned to publication platforms themselves as knowledge infrastructures. I’ve actively sought out venues whose operational values match the values I espouse in my research – openness and accessibility (and, equally important, good design!) – as well as those that The New School embraces through its commitment to public scholarship and civic engagement. Thus, I’ve steered away from those peer-reviewed publications that are secured behind paywalls and rely on uncompensated editorial labor while their parent companies uphold exploitative copyright policies and charge exorbitant subscription fees. I’ve focused instead on open-access venues. 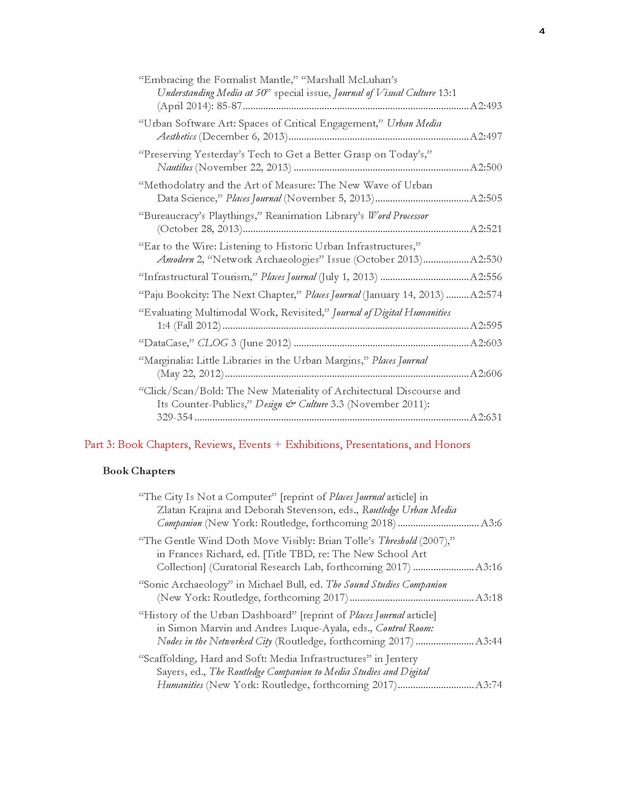 Most of my articles are freely available online, and even my 2015 book, Deep Mapping the Media City, published by the University of Minnesota Press, has been made available through the Mellon Foundation-funded Manifold open-access publishing platform. In those cases in which I have been asked to contribute work to a restricted peer-reviewed journal or costly edited volume, I’ve often negotiated with the publisher to allow me to “pre-print” my work as an article in an open-access online venue, or to preview an un-edited copy. I’ve been invited to address the ethics and epistemologies of scholarly publishing and pedagogical platforms in a variety of venues, including the Columbia University Center for Digital Research and Scholarship, the Bard Graduate Center, Fordham University’s Digital Pedagogy Workshop, the Cornell Conversations in Digital Humanities Series, and the CUNY Digital Humanities Initiative (you’ll find a full list of my presentations in A3:314-21). I also often chat with graduate students and junior scholars about their own “publication politics” and appropriate venues for their work, and I review their prospectuses and manuscripts. The most personally rewarding and professionally valuable publishing experience of my post-tenure career has been my collaboration with Places Journal, a highly regarded non-profit, university-supported, open-access venue for public scholarship on landscape, architecture, urbanism. 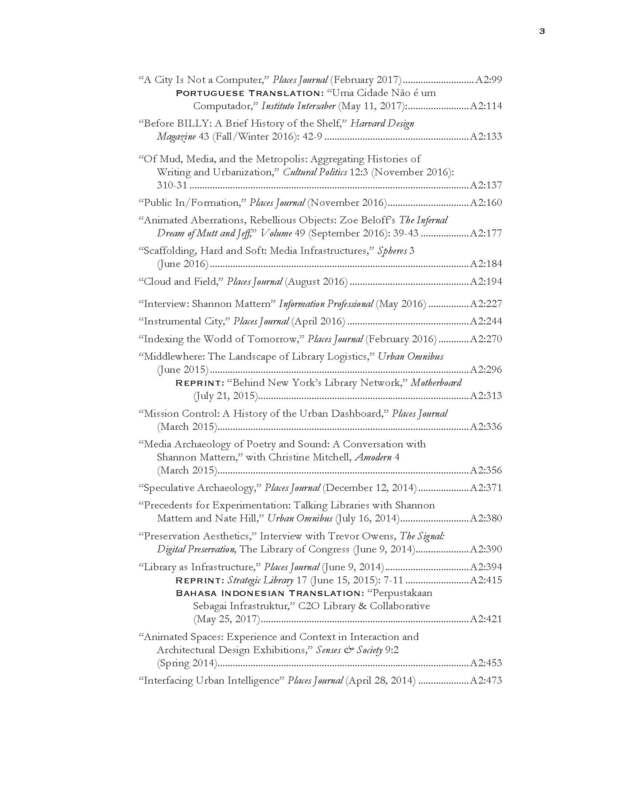 After having written thirteen (fifteen by Fall 2017) long-form pieces for Places since 2012, I’ve effectively assumed their “urban data and mediated spaces” beat (you’ll find my Places publications, along with all of my articles, in Appendix A2). I work with paid, professional editors who care not only about subject matter – they’re just as much domain experts as any academic peer reviewer I’ve encountered – but also about clarity and style and visual presentation. My research and writing process for Places is no less time- and labor-intensive, and the editorial process is no less rigorous, than would be required for a traditional academic publication, but Places (and my work with other open-access venues) allows my work to reach a global, interdisciplinary audience in a timely manner, via a smartly designed platform that allows for rich illustration. This public scholarship has a different “impact” than pay-walled publications in prestige journals. Yet the response to my work on social media, the number of citations it’s received (in both scholarly and popular literature), and the number of invitations it’s generated, suggest the promise of such alternative infrastructures for academic publishing. By making my work open and accessible, I’ve still managed to meet many of the prestige- and scarcity-driven markers of academic excellence (for more on my work’s impact, see A3:343). MEDIA OBJECTS. My work often starts with the small and concrete, with a particular media object, and then demonstrates how big and complex that small thing is when we situate it within its broader cultural, political-economic, and infrastructural contexts. One such object is the file. I’ve spoken at ArtCenter College of Design and the University of Amsterdam about how humble index cards, folders, and fiches constitute the formal and functional bases of our organizational and computing systems, and how they establish a logic and ideology for the ways we organize the world. As I describe in my “Indexing the World” “Small, Moving Parts,” and “Bureaucracy’s Playthings” articles, files are mediators of larger epistemologies and ontologies, from the institutional to the global scale. Zines, too, are modest media objects whose format embodies an ethic of production and a community’s politics. My “Click/Scan/Bold” article examines the state of architectural design and discourse through the rise of architects’ little magazines and zines in the early aughts. I was invited to further address the politics of “little” publications for Arquine, a Mexican design magazine, and at Paper Tiger Television’s 30th anniversary workshop in 2012. And as the daughter of a cabinetmaker, I’ve long considered the functional, affective, and even intellectual dimensions of furniture: how a particular bookshelf structures my engagement with media and frames my intellectual labor. I began my work on “intellectual furnishings” – the epistemologies embodied in desks, chairs, and media storage equipment – as a 2014-15 fellow at The New School’s Graduate Institute of Design, Ethnography and Social Thought, and I continued this work as a 2016 senior fellow at the IKKM. I’ve been invited to present this work elsewhere: at the University of Buffalo’s Media Study program, in Columbia University’s “Book History” colloquium, and as part of the “Critical Infrastructure Studies” panel at the 2018 Modern Language Association conference. And I have published, and am publishing, parts of this research in Harvard Design Magazine; VOLUME, a prominent Dutch architecture magazine; Places Journal; and Perspecta, Yale’s architecture journal. This research also informed my contributions to “Furnishing the Cloud,” a 2015 New School exhibition exploring ergonomics for the cloud-computing era (A3:298); as well as my work with Parsons’ Architecture program and the New York Public Library’s Correctional Services to design new book carts for the librarians in New York’s correctional facilities. We documented our work in a self-published book (A3:108). I’ll be expanding this furniture research in my next monograph, tentatively titled Case Studies: An Intellectual History of Media Furniture, and [REDACTED]. Other “epistemological tools” and equipment – from time-telling devices to archival and urban interfaces – have been the subject of many talks and publications, including my “Interfacing Urban Intelligence” and “Animated Aberrations” articles. I’ve shared this work in a variety of venues, from Utrecht University, to the VERGE Transdisciplinary Design conference at The New School, to a transportation infrastructure symposium at the Center for Architecture in New York. I also study the infrastructural lessons embodied in individual artworks and exhibitions. I was invited to speak about “archival aesthetics” – what archive-inspired artwork can teach us about the ideologies and epistemologies of archival practices – as a keynote at the 2014 “Digital Preservation” conference at the Library of Congress, and as an invited faculty member at the 2015 Princeton-Weimar Summer School on “Archive Futures.” I emphasize that these aesthetics are more than visual; multisensorial ways of knowing have long been a theme in my work. 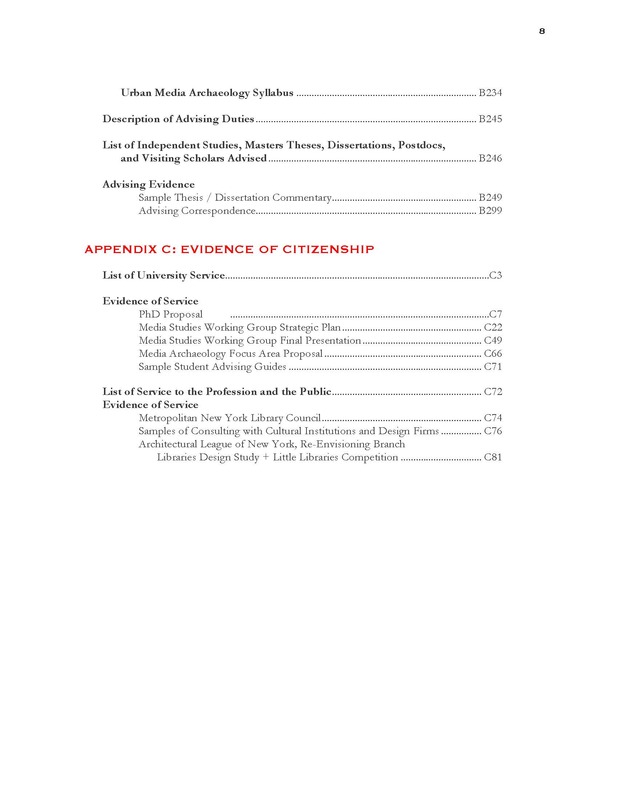 I was invited to lead a panel on multisensory exhibition design at the Metropolitan Museum of Art in 2012, and I then examined these “embodied” curatorial techniques for the Senses & Society journal (A2:453). I’ve also written about the infrastructural intelligences underlying a number of other artworks: Brian Tolle’s Threshold installation at The New School (A3:16), artist Simon Denny’s Secret Power project at the 2015 Venice Biennale (A2:4), and artist Zoe Beloff’s media archaeological installations (A2:177). The archive itself, and the mediated objects within its collection, have been common themes in my work, too. In various invited presentations – at UnionDocs, Poets House, the New Museum, and the new National Audiovisual Institute in Warsaw, Poland – and in various publications I’ve discussed sound archives, social media archives, and archival infrastructures for marginalized communities. My “Media Archaeology of Poetry and Sound” and “Preserving Yesterday’s Tech” articles focus on sound archives and the challenges of preserving volatile media archives. And to celebrate the accomplishments of the legendary NYPL Labs, the library’s recently shuttered R&D unit, its former director and I published an interview about building archival infrastructures for urban memory (A2:88). I address related issues about the library as a mediator and bulwark for public information literacy and privacy in my “Public In/Formation” article. MEDIA ARCHITECTURES. The archive and library as physical spaces, as media architectures, have been primary concerns since my dissertation. At invited talks at Johns Hopkins, Smith College, the Pratt Institute, the Yale School of Architecture, and elsewhere (including a keynote at the 2014 Rare Books and Manuscripts Librarians’ [RBMS] national gathering) I’ve discussed the value of imagining these institutions as architectural and media infrastructures. My “Library as Infrastructure” article has circulated widely, was recently translated in Bahasa Indonesian, and inspired a 2016 interview in a Dutch information science magazine (A2:227). I’ve also written, in “Middlewhere” and “Behind New York’s Library Networks,” about the widely distributed physical and digital logistical systems connecting branch libraries, research institutions, and media repositories. Some of those repositories are housed in reclaimed limestone and salt mines. I’ve examined these massive “geologic” archives, where we aim to preserve our media artifacts for a posthuman future, for Harvard’s New Geographies. At the opposite scale are small pop-up, guerilla libraries, from Occupy camps to street-corner book-shares. I’ve written about how these “little libraries” reflect our relationships to privatized, restricted information resources and urban landscapes (A2:606). Many of these media storage infrastructures embody contradictory values: closing off in order to keep open the possibility of access over the longue durée, and adopting logistical systems perfected in the private sector in order to optimize a public service. Several colleagues and I explored such political issues in our “Democratizing the Archives” working group, supported by a 2012-13 Innovations in Education Grant. My own work has examined media architectures embodying ideologies quite far removed from those of the democratic public library. I’ve written, for example, about surveillant “smart city” command centers and the history of the “urban dashboard” in “Mission Control,” a widely circulated article that was later anthologized in two edited collections. MEDIA CITIES. The so-called “smart city” has been the subject of many of my recent articles in Places and other venues, and of several events in which I’ve participated (and some of which I’ve helped to organize; see, e.g., A3:248). My articles “Interfacing Urban Intelligence,” “Methodolatry and the Art of Measure,” and particularly “Instrumental City,” about the smart technologies and techno-solutionist ideologies embedded in New York’s Hudson Yards development (A2:244), have been cited widely, and have led to many speaking invitations (including a recent invitation to deliver a keynote in China, which I sadly had to decline). For millennia, our cities have been designed to foster “broadcast”; they’ve been “wired” for transmission; they’ve hosted architectures for the production and distribution of various forms of intelligence and served as hubs for records-management; they’ve rendered themselves “readable” to humans and machines; they’ve even written their “source code,” their operating instructions, on their facades and into the urban form itself. They’ve coded themselves both for the administrative technologies, or proto-algorithms, that oversee their operation and for the people who have built and inhabit and maintain them. MAPPING INFRASTRUCTURES. Over the years I’ve also explored methods for excavating the deep history of urban mediation and identifying its historic infrastructures. One such method is mapping. My 2015 short-form book, Deep Mapping the Media City, based on a keynote address I delivered at the Helsinki Collegium for Advanced Studies in 2013, was written to serve as a teaching text and methodological provocation. Drawing on our work in my 2010-13 “Urban Media Archaeology” studio (B:234), I propose multisensory cartography as a means of examining the richly intertwined infrastructures of our mediated cities. This work has generated some excitement among geographers, who have invited me to talk and write about “maps as media” in their own disciplinary venues (for more about the impact of my mapping work, see A3:343). Sound mapping offers particular methodological challenges and opportunities. My “Ear to the Wire” article and “Sonic Archaeology” chapter, which I began developing in a 2012 fellowship at the Canadian Centre for Architecture (A3:342), examine what we can learn by listening to cities past. Yet these cartographic and sensory methods apply equally well to contemporary investigations. My “Infrastructural Tourism” article, which surveys methods for mediating and experiencing infrastructure (communications infrastructure in particular), has led to many talks and master classes, from Amsterdam to Sydney (A3:314, B:9). I extended this research in my 2016 “Cloud and Field” article, which explores “extreme” infrastructural field work in which researchers and designers seek to “visit” The Cloud – our global atmospheric information infrastructure – and develop field guides in various media forms to trace their journeys. Here, we see that nesting of infrastructures I mentioned earlier: tiny field guides function to illuminate a vast media geography. These methods have proven to be illuminating and provocative pedagogical strategies, both in my own classes and in other universities, where faculty have incorporated my work into their syllabi. Multisensory cartographic methods serve as both intellectual and material “scaffolding” (as I describe in a chapter for the Routledge Companion to Media Studies and Digital Humanities) for teaching and learning about mediated objects, architectures, infrastructures, cities, and landscapes (A3:74). TEACHING RESPONSIBILITIES. Many of the courses I teach are inspired by, or have inspired, my scholarship. Since Fall 2011 I have taught nine different classes: required and elective; lecture, seminar, and studio; theory, production, and hybrid-format; graduate-only and mixed grad/undergrad. These courses regularly attract students from across the university. Both my Fall 2016 “Maps as Media” and Spring 2017 “Urban Intelligence” classes, for instance, drew students from eight different graduate and undergraduate programs. As I’ll address in the Citizenship section below, The New School has sought to encourage such cross-program integration, and I’ve been a part of these initiatives both as a committee member and as a model of such integration. Course codes, descriptions, and enrollments are listed on B:3-8. Appendix B features six of my classes, which represent a range of topics, pedagogical approaches, goals, and student populations. I begin with a traditional graduate seminar, “Bookshelves to Big Data,” which also happens to be one of my favorite classes. Next is a hybrid grad/undergrad, theory/practice studio, “Maps as Media”; followed by another hybrid course, “Urban Intelligence,” which was supported by an Innovations in Education Grant that allowed me give each student a $200 materials budget, thus encouraging some ambitious experimentation (and allowing me the great pleasure of reconciling lots of receipts!). My final featured course is “Understanding Media Studies,” a challenging and much debated “intro to grad studies”-style lecture course that’s been required of all of Media Studies’ first-semester MA students since 2008, yet which only seven of Media Studies’ 33 principal faculty have been asked to teach. I share this class to demonstrate how I’ve attempted to adapt to institutional change, evolving student needs, and (within reason) student demand. I’ve also included the syllabi for two other representative and popular classes: my “Media and Architecture” seminar and my now-retired “Urban Media Archaeology” (UMA) studio, both of which were instrumental in the development of my new book, Code and Clay. For UMA, we partnered for four years with Parsons faculty and students to develop our own custom-designed, open-source mapping platform, the Urban Research Toolkit (URT), to feature the students’ research on historical urban media infrastructures (A3:313). After four years of volatility – of student developers and designers pulled from the project by prestigious internships and jobs, of unstable technical infrastructure and no promise of institutional preservation – we pulled the plug on URT, and I retired the course. Still, the class built atop that technical platform was a memorable success – one I was asked to share at numerous conferences, from UCLA to the Harvard metaLab to Bard College, and which I chronicled in my Deep Mapping book. TEACHING PHILOSOPHY. As a scholar inspired by architecture and infrastructure, I think of teaching as the collaborative creation of an infrastructure for students’ guided, self-directed, and, ultimately, life-long learning. Now, please pardon me while I belabor this metaphor: I begin constructing each class by laying a pedagogical and theoretical foundation and establishing a methodological framework. My students and I collectively build out the scaffolding, and then each student experiments and tests ideas and projects within that structure. Despite the collaborative nature of the job, it’s still my responsibility to plan meticulously and come prepared with all the necessary tools and supplies. My student evaluations demonstrate that I’m famously well prepared, and that my courses are consistently well organized. This prep work is essential: in order to create a space for students to explore their own interests through a variety of scholarly and creative forms, I’m responsible for introducing them to, and helping them to select carefully from, a variety of critical concepts, methods, and tools of presentation. In my “Maps” and “Urban Media Archaeology” classes, for example, we don’t simply make maps. We pull apart the map as a historical, political, technical, epistemological, and aesthetic medium. We explore diverse approaches to cartography, and then we make maps that have embedded within themselves gestures toward their own self-critique. The small and local are infinitely big and complex. In the classroom we ask big questions: What constitutes fact or evidence? Whose experiences are excluded from the archive? How do maps define spatial ontologies? Do classification systems reify prejudices? What values should guide how we use technology in urban design? And in addressing those questions we engage with some big theories, from Foucault’s “archive” to Haraway’s “situated knowledge.” I’ve found that the most effective way to engage with those big ideas (particularly for theory neophytes) is to home in on a concrete “thing” – to start with a delimited case study, a modest field site, a familiar media object – then spiral out by exploring the networks and interlocking infrastructures that extend from that seemingly small thing, and concurrently pushing the analysis from the concrete to the abstract. In my “Urban Media Archaeology” and “Maps” classes, students investigate each week’s central theories and critical concepts through “map critiques,” which require them to start with a single cartographic object and build an analytical scaffolding that ultimately connects back to the week’s theoretical framework. In “Bookshelves,” too, students share “application exercises” that bring our theoretical readings to life in real-world places, things, exhibitions, and current events. Students’ evaluations indicate that they enjoy these exercises, which often evolve into their final projects. The intellectual is material and ideological and aesthetic. We examine case studies through multiple lenses: aesthetic, political, and epistemological. The built spaces we survey in “Media as Architecture,” the “smart” infrastructures we explore in “Urban Intelligence,” the soundscapes we experience in “Sound and Space,” the media artifacts we collect in “Media and Materiality”: all lend themselves to such multifaceted analysis. And by examining what politics and epistemologies are embodied in our existing media objects and architectures, students can then imagine designing them otherwise. In “Bookshelves,” we worked with renowned speculative designers Fiona Raby and Tony Dunne to imagine physical and virtual interfaces for future knowledge repositories. And in “Urban Intelligence,” students developed proposals for intelligent cities that critique the “smart city” model; their work is featured on our class website and in an article we’ve jointly authored for Leonardo Electronic Almanac (A2:12). Methods and tools are epistemological and political assemblages. All of my classes are, in one way or another, methodology classes. In “Bookshelves” we explore practices for organizing, digitizing, circulating, and preserving various media objects. In “Urban Intelligence” we interrogate data-driven planning. In “Understanding Media Studies,” we compare and contrast the various research methods and production strategies employed by our guests, who range from scholars to artists to engineers (I strive for multiple forms of diversity: 60% of our Spring 2017 guests were women and 60% were people of color). Through their analysis of existing work, students then recognize the weight of their own methodological and technical choices. My goals are to help students realize that methods and technologies are empowering political tools they can wield to effect change in the world, and that with that power comes ethical responsibility. The exhibitions they curate for “Media and Materiality” and the atlases they construct for “Maps” (which many students then integrate into their theses) are more than mere class assignments; they have the potential to become tools for social practice. And in Spring 2014, when I was asked to design a “Digital Archives” class to feature some newly acquired archival material, my students and I (without the promised technical support) partnered with the university’s archivists and devised our own methods for showcasing and contextualizing these materials while also honoring the archival labor that made them accessible. Knowledge is embedded in people and places. For each lesson, I aim to develop a balanced collection of readings: I match challenging theoretical texts with accessible applications in public scholarship, then add technical or “grey” literature from professionals who enact those theories in their practice. We don’t just read about “The Archive” through Derrida. We also engage with the literature in library and archival science, and we enter the archive itself. Each fall my “Bookshelves” class descends into the bowels of the New York City Municipal Archives, where we talk to archivists as they process new acquisitions, to conservators as they preserve historic NYPD photos, and to digitization experts as they calibrate their equipment to digitize a set of maps. In “Urban Intelligence,” we began our Spring 2017 semester with a visit to Intersection, Alphabet’s urban tech division, to see their work in Hudson Yards, New York’s biggest “smart city” development. Later that semester, through a public event I co-organized with the renowned Storefront for Art and Architecture, students engaged with seventeen practitioners from such diverse fields as urban informatics, preservation, policy, anthropology, and more (A3:248). To take one final example: I redesigned “Understanding Media Studies” for its final iteration in Spring 2017 to incorporate more student engagement with our guest presenters’ larger bodies and communities of work, with assignments designed first to prepare the students to ask our guests smart and probing questions about their methods and motivations, and then to develop a critical response reflecting on those discussions and drawing parallels between our guests’ work and the students’ own goals (B:189-206). In short, I strive to demonstrate that theory and practice are not separate, hierarchically ordered worlds – one scholarly, the other applied. Embedded, embodied, situated knowledge enacted by skilled practitioners in our archives, administrative offices, map labs, design studios, and elsewhere serves as a critical anchor for, or perhaps an antidote to, ungrounded theory. Theory is a cultural production. Finally, I aim to demystify (and, I’ll admit, desacralize) theory by helping students put it into context. Rather than reifying theory’s Great Men, we strive to historicize theoretical movements, investigate their politics, and examine what cultural or political-economic contexts, what “intellectual infrastructures,” might explain the rise of a particular thinker or idea at a particular time. We discuss theory as cultural symptom, as academic currency, as cultural capital, and as political instrument. Through this “profaning” of theoretical gospel, I hope to encourage students to regard theories not as truisms, but as critical apparatae that help us make sense of things, frameworks that help us ask questions, tools that help us do things in the world. Students occasionally offer constructive criticism about our readings, assignments, or course structure. I carefully consider their recommendations and often incorporate them in syllabus revisions. For instance, in “Maps,” which is a relatively new class, I’ve acted on my Fall 2015 students’ suggestion to build in more incremental assignments and a mid-semester critique, and I plan to use a Fall 2016 suggestion to have students weave more critical insights from the readings into their final atlases. UMS students from 2014 asked for more time to reflect on our guests’ presentations, so I integrated more open discussions in 2017. Other students’ comments address equipment, facilities, and technical support issues that are, to a large degree, beyond my control; and a few others offered anomalous critiques. There are two classes for which I received mixed evaluations, and which require explanation. First, as part of an agreement between the School of Media Studies (SMS) and the Independent Film Project (IFP), our Spring 2014 “Sound and Space” class was chosen to take place in the brand-new Made in NY Media Center in Dumbo, Brooklyn. Seizing the opportunity, my colleague Barry Salmon and I spent much of the Fall 2013 semester making plans for Dumbo-specific field recording exercises and soundwalks, a sound symposium in the Center’s auditorium, and even an end-of-semester student exhibition in the Center’s gallery. After the first week of the Spring semester, however, the agreement between SMS and IFP fell through, and the course was abruptly resituated in a cramped, technically deficient lab on campus (whose roaring HVAC system created tremendous communication challenges with my hearing-impaired colleague). Ultimately, our months of site-specific planning were rendered futile, and those plans proved impossible to translate to the new location. The students, like their instructors, were justifiably disappointed. Second, my less-than-stellar evaluations for “Understanding Media Studies” are consistent with, or higher than, those of my colleagues who’ve also taught this ever-complicated class. I offer some historical context for the course and its challenges on B:222. Despite these occasional internal complications, my teaching has received a great deal of positive attention from across The New School, where I’m regularly invited to give guest lectures in colleagues’ classes and to serve as a guest critic in their studios. You can find a list of my 35 guest lectures and additional critiques on B:9-12. I’ve been invited to teach in a number of different programs in Parsons and Eugene Lang College, but infrastructural complications have often prevented me from doing so. My courses have also resonated beyond The New School. I’ve been invited to offer master classes and workshops in Seoul, Amsterdam, Hamburg, and Sydney, and at Smith College, Cornell University, and elsewhere. My “Bookshelves” class has drawn a variety of external auditors – from library administrators to celebrated poets – who’ve greatly enriched our discussions. Eminent archivist Rick Prelinger has called it “THE class on the future of memory and access practices” (see B:35). The course website has also circulated widely, generating invitations for me to speak about the class and my “media studies approach” to librarianship and archivy in 2014 keynote addresses at the Library of Congress and the national rare books and manuscript librarians’ gatherings, and at the New York Art Resources Consortium conference at MoMA in 2015. For my invited talk at the 2017 Association of College and Research Librarians’ conference I was again encouraged to address the “Bookshelves” class. I’ve also been invited to share my “Urban Media Archaeology” and “Maps” classes in a variety of venues, among artists, geographers, digital humanists, and information designers, many of whom have told me that the “Maps” class in particular has inspired them to rethink the way they teach cartography. And “Urban Intelligence” elicited an invitation from Columbia University Press to transform the class into a short book (I’m still ruminating on the offer; see B:151). Despite these commendations, I always seek to improve my teaching by remaining current, responsive, and engaging. I’m always exploring new texts and case studies, refreshing my presentations, planning new field trips, exploring new external partnerships, and reading about the latest developments in higher education. For my studio classes, I enjoy working with teaching assistants from various Parsons programs, so we can learn from each other in developing exciting and innovative design workshops and tutorials. You’ll find several examples of such pedagogical experimentation in my “Urban Intelligence” class documentation (B:122-44). STUDENT ADVISING. My work with individual students likewise enriches my teaching (and inspires my research and service). Ours is a Masters-only program. I typically work with 20 to 30 Media Studies MA advisees, yet I also meet regularly with dozens of Masters students from across Parsons, as well as a few PhD students and undergrads. The Parsons students frequently invite me to consult on their class projects and theses and to attend their program critiques. As I mentioned above, I also work closely with my teaching assistants, involving them in planning meetings, encouraging them to integrate their own work into the class, and inviting them to co-facilitate lessons. While they assist me in leading my classes, I aim to help them develop their teaching skills. And nearly every week I meet with at least one New School alum to discuss her current work and future plans. I commonly review current advisees’ and alums’ PhD applications and conference abstracts, and I typically find myself writing a couple dozen recommendation letters each semester. Students from other local and global universities frequently seek me out, too. In all, I spend at least ten hours each week on routine academic advising, both in-person and virtual. I offer a more thorough description of my advising work, along with samples of my advising correspondence, on B:245, B:299. THESIS AND INDEPENDENT COURSEWORK ADVISING. Over the past six years I’ve advised ten independent studies, served as primary advisor for eleven Masters theses in Media Studies and various Parsons programs, and served as secondary/external reviewer for six more. Among those students, four have won the School of Media Studies’ Thesis Award, two have won academic excellence awards, and six are currently enrolled in PhD programs at Brown, Columbia, and NYU. While still working on their theses, several of these students presented their work at competitive conferences, published their research in peer-reviewed journals and edited collections, and screened their work in festivals. I typically assisted by forwarding relevant CFPs and offering help with proposal-writing and revisions. We have no media PhD program at The New School, yet I’m currently serving on two PhD committees, one at Columbia and one at NYU. I’ve also served as an external reviewer for four dissertation and proposal defenses at NYU, the University of Copenhagen, Cornell, and the University of Melbourne. I’ve also advised a postdoctoral fellow and two visiting scholars (one a Fulbright scholar) and served as external advisor for a curatorial fellowship. I’ve worked to help these folks get grants, develop new classes, publish their work, and build their professional “infrastructures.” I list all of my independent advising activity and provide samples of my feedback on B:246-98. DEPARTMENT SERVICE. I’ve been a reliable, engaged University Citizen since the moment I arrived at The New School in 2004. Within my first five years, I served as Thesis Coordinator (acting as external reviewer on about 50 theses per year), Admissions Coordinator (reviewing roughly 400 applications per year), and Director of Graduate Studies for a program with 500+ students and 60+ faculty. I also filled in for our Student Advising Coordinator and Executive Secretary for a few months, too. Phew. While the past six years have been less administratively burdensome, I’ve remained actively engaged in faculty governance and program development. You’ll find a complete list of my internal service activity on C:3-6. Within the School of Media Studies, I’ve served for three semesters as organizer, producer, and M.C. of our Monday night lecture series, for which I brought nearly 50 scholars, artists, media-makers, producers, and alums to campus (see A3:265, A3:282). I also contributed to a Spring 2014 working group dedicated to the redesign of our New Student Orientation and authored a series of 13 student advising guides meant to serve as a resource for faculty across the program (C:71). In addition, I chaired the “Media Archaeology” curriculum committee, charged by our then-dean to develop a focus area in the field. You’ll find our report on C:66. Finally, I served on six School of Media Studies faculty review committees and acted as chair for two of them. DIVISIONAL SERVICE. For the Schools of Public Engagement division, I served on two faculty review committees and worked for several years as a member of our space planning committee, which was charged with envisioning workspaces, classrooms, and labs for our new facilities at 79 5th Avenue. Two other divisional service appointments have proven to be my most labor- and time-intensive obligations for the past several years. First, in Fall 2016 I served as co-chair of the Media Studies Working Group, charged with developing a strategic plan for the school. Our work involved extensive primary and secondary research, including regular consultations with our own faculty and faculty in other programs, and student focus groups, as well as periodic presentations to upper-level administration and board members. You’ll find our final report and presentation on C:22-65. Second, I’ve served for four years as a member of the division’s time-intensive Renewal and Promotions Committee, which is responsible for vetting all divisional faculty reviews, up to twelve per semester. Finally, from 2008 to 2012 I participated in various iterations of a cross-divisional, praxis-oriented PhD committee. In 2013, the Provost charged me with transforming that past committee work into an official program proposal. I worked with a research firm to study “practice-based” and “design-led” PhD programs around the world, planned a “stakeholders” meeting with various industry and cultural representatives who could potentially hire our graduates, and developed the academic portions of the New York State proposal. You’ll find a draft on C:7-21. Ultimately, the Provost’s office tabled the proposal because of uncertainty regarding its funding, but I’ve learned recently that the PhD discussions have been revived, and I hope to be a part of them. SERVICE TO THE COMMUNITY AND PROFESSION. I’ve contributed to the broader academic community by serving on five external tenure and program review committees and reviewing manuscripts for a variety of university presses and journals, from Yale University Press to Big Data & Society. I’ve also served on a number of editorial boards: MediaCommons, the Harvard Sensory Ethnography Lab’s Sensate project, the Journal of Visual Culture, and Amsterdam University Press’s MediaMatters series. Extending beyond academia, my research and teaching have opened several opportunities for me to serve the local and international design communities. I was invited to act as a juror and consultant on two Architectural League of NY projects: its 2013 “Little Libraries NY” competition and its 2014-15 “Re-Envisioning Branch Libraries” design study, with which I was intimately involved (C:81-92). I’ve consulted (pro-bono, or nearly so) on a number of other projects with a variety of cultural institutions and design firms, including the New York Public Library and the New York Transit Museum. I thoroughly enjoy and look forward to many more such collaborations. You’ll find all of my professional and community service listed and documented on C:72-92. Finally, my library-related publishing and teaching – and the fact that I’m approaching the subject not as a librarian, but through the lenses of media and design – have led to my appointment to the board of directors for the Metropolitan New York Library Council, which serves nearly 280 libraries and archives in the metropolitan area. This forward-thinking institution is developing resources, services, and fellowships to aid its member institutions, and to serve as a model for other institutions around the country and the world (see C:74-5). Their staff have contributed to my classes and have even invited my students to consult on various projects. I look forward to continuing my work with Metro. I’m eager to build more intellectual, pedagogical, technical, and social infrastructures at various scales: within my own classrooms, between classes and programs, at the university scale, between The New School and the city, between The New School and other global cities and landscapes, within my own discipline, and between media studies and the various fields of research and practice with which I’ve connected. I most enjoy working in these interstitial spaces, serving as an epistemological and institutional mediator. I’m most stimulated by collaborating with faculty colleagues and students from diverse programs, asking questions and offering responses that draw together disparate methods and intelligences. I’ve received several forms of confirmation that I do my best work in these in-between spaces, too. My classes draw students from multiple programs. Students from across the university seek me out for advising. I’m frequently recruited for committees in, or between, other divisions. I’m invited to consult on projects at a wide variety of cultural institutions. I’ve entertained invitations to teach classes or take positions in other New School programs and to apply for jobs in other fields at other institutions. I like being distributed and networked, and I’m eager to serve in the kind of mediator role that is required by so many of the stickiest, most pressing challenges of our time – including those I mentioned at the very beginning of this document. What does this mean for me at The New School? My goal is to assume leadership positions that allow me to build these connective infrastructures. I’d love to serve as a University Professor, bridging disciplines and divisions, and run a transdisciplinary lab (many of my courses are already mini-labs in themselves!). I could leverage my relationships with external organizations, pursue funding, and explore new collaborative networks. More modestly and immediately, I’m eager to incorporate some of these same inspirations and values into my two book projects and future public scholarship, and perhaps to transform my “intellectual furnishings” project into an exhibition, as many international colleagues have encouraged me to do. I look forward to developing my existing courses and building new ones, including some housed in other programs and divisions and offered in partnership with colleagues in other fields. And I’m committed to shaping the future of media and design studies and doctoral education at The New School. As a full professor in a leadership position, I can help to build these pedagogical, intellectual, technical, and social infrastructures for new ways of thinking and acting in the world. The New School, in all its perpetual newness and “becomingness,” is an ideal environment for such connective work.